I saw a post somewhere (either here or at Profiler's forum) that inspired me to create this marathon. That person had traveled around the map watching films set in different countries. I have a pretty good collection of non-US films, so I thought I would travel around the map watching films by their country of origin. I'll post a list of what I have to choose from as I get to each country though there are some countries I only have one film from. I won't list all my US films, or my large collection of anime when I get to Japan. Since I live in the US, I'm going to start here (on Sunday or Monday) with a film from my home state, Kentucky: Harlan County USA. I'm including a list here of the countries I have/intend to cover and the film we watched. Spent a few days near Lexington in 2010 and it was a really friendly place. I think it was Rich who did something similar here a couple of years ago. I'm looking forward to your reviews. You are certainly of to an interesting start, not at all an obvious choice for an US film. If you are doing countries that are no more, can I recommend Hey Babu Riba for Yugoslavia? Great movie. Yup, I'm doing a few countries that don't exist anymore (USSR, Czechoslovakia, Yugoslavia & East Germany) and I even have Hey Babu Riba. Oh, this gets more and more interesting. Thank you! Since there is some interest, here's my list of countries and the order of travel. I am wondering though... Why 86? I am pretty sure Rich did 80, based on the movie title. Just curious, basically it's "the more reviews the better". Kentucky is the 15th state to join the USA. It was once hunting grounds for Cherokee, Shawnee and Iroquois tribes. Today Kentucky is known for its bourbon, horse racing, bluegrass music and it's fried chicken. Also, it's coal country. Barbara Kopple's Academy Award-winning Harlan County USA unflinchingly documents a grueling coal miners' strike in a small Kentucky town. With unprecedented access, Kopple and her crew captured the miners' sometimes violent struggles with strikebreakers, local police, and company thugs. Featuring a haunting soundtrack—with legendary country and bluegrass artists Hazel Dickens, Merle Travis, Sarah Gunning, and Florence Reese—the film is a heartbreaking record of the thirteen-month struggle between a community fighting to survive and a corporation dedicated to the bottom line. A powerful and important film. This is a film I wish more people would watch. I don't know that I necessarily agree with Marx about all history being the history of class struggle, but by God it's somewhere up there. The clarity of the gap between the rich and the poor is absolute here, the conditions of what was once called "The Other America." The film clearly demonstrates the importance of unity, that a united people can achieve collective rights but that the fight is hard and those in power will kill to stay there. I was very struck by the comment about the man vs. the mule, and not leading the mule into danger - "we can hire another man, we got to pay to replace that mule." It's clear how important people, individual people, are to corporations. Kopple's style of filming, what I would call participant-observation, allows the story to unfold before you. She inserts some historical footage, and uses traditional and Bluegrass songs to give some background, but there's no narration. This is all about showing you what's happening rather than telling you about it. It's very effective here, especially when gunfire breaks out and the cameraman goes down. You really are there, in Harlan County, at that moment. This hits somewhat close to home. This was filmed just before I was born. My grandfather was from Appalachia, he started working in a coal mine at the age of 10. He got out of the region by enlisting in the Army in WWII. All of his brothers (10!) worked in the mine. His eldest brother died of cirrosis - before the black lung could kill him. When I look at what's going on in our beautiful state today, the focus has changed but the core issue - that a few people have power and the vast majority have none - has not. Today they prefer to blast the tops off our mountains and destroy the land, since the traditional method has played out and no longer turns profit. I'll admit it, I'm biased. I side with the workers, with the little man. Down with corporate power, down with corporate greed. Not exactly a country, but also not exactly part of the USA - it's an "unincorporated territory." For the purposes of this marathon, I've decided to count it separately. I only own one film from Puerto Rico - Casi Casi - so that's what we'll be watching. In the spirit of Mean Girls and Election comes a hilarious new high school romp. Emilio is a typical teenager with typical teenage problems. He's got a crush on Jacklynne, the most popular girl in school, and has decided to run for Student Council President to win her affection. There's only one problem: she's decided to run against him! As the campaign mounts and tensions rise, Emilio devises a plan that could easily backfire if his diabolical principal founds out about it. Casi Casi was a cute, funny teen film, about a boy's crush on the pretty, popular girl and the lengths that his friends go to in helping him try to win her heart. It's also - in fact, primarily - about the value of real friends, friends who are there for you when you need them, and not overlooking what's right in front of you. It's a really funny film, both of us laughed multiple times at what was going on. It's a low budget film, most of the actors are amateurs and this was the first time making a film for the directors. Because of that, it's about the story - basically a caper of how Emilio is going to rig the election for Jacklynne - and about the characters. Each of Emilio's friends is a unique individual, very natural and believable. It was easy to suspend disbelief and just get into the story. Sure, they wouldn't get away with it in real life, but it totally works in the film. Overall, a cute, fun film suitable for just about anybody. Like Puerto Rico, I only own one film from Cuba - Nada+ - so, that's what we'll be watching. It'll be the same for the next 2 countries as well, but there'll finally be a list once we get to Mexico. Carla, a postal worker in Havana, fulfills her romantic longings by opening letters and rewriting them into passionate prose before sending them out again to their intended recipients. After her co-worker Cesar catches her, Carla turns her amorous talents on him. Beautifully filmed in black and white with accents of brilliant color, Cuba's 2003 Oscar entry combines visual humor, poetry, satire of Cuban bureaucracy and a lighthearted love story. A lovely and fun movie, Nada+ has been compared by others to the French film Amélie. I can see the comparison - both feature imaginative young women who alleviate the loneliness of their lives by helping others anonymously - and though Amélie is by far the better film, Nada+ was also a good watch. The two films came out the same year, so I don't think it can be said that one was influenced by the other. Nada+ makes the most of its low budget with clever camera shots and techniques. Most of the film is black-and-white, but strategic bursts of color enhance the film - to me it seemed like the b&w emphasized the ordinariness of life, while the color enhanced the little things that brought the characters pleasure and a break from tedium. The camera moves into unique shots, such as a first-person shot when Carla is called into the boss's office - giving that moment the feel of dread one gets in such a moment. There are also tiny bits of animation and animation-style shots that give the film a unique look. Carla is suitably neurotic, as one might expect from someone who steals letters and rewrites them, but she's also very likable and sympathetic. If Cesar seemed flat at first, the entire film is from Carla's perspective and in the beginning she doesn't know him. He's the handsome co-worker she's always noticed but never spoken to. The boss and her underling were very over-the-top in performance and character, but it suits the style of filming and worked well here (and they reminded me of the principal in Casi Casi). It was good movie and I'd recommend it for anyone who enjoys independent films. This small island's varied landscape, its location in the heart of the Caribbean, and its longstanding place at the center of Cold War politics have all combined to preserve some of the richest and most unusual natural environments of the hemisphere. For decades, Cuba's wild landscapes lay untouched while its Caribbean neighbors poisoned or paved over their ecological riches. Now, Cuba's priceless treasures are about to face an onslaught. Tourism is already on the rise and most experts predict tourism will double once the U.S. trade embargo ends. What will happen to Cuba's stunning biodiversity? 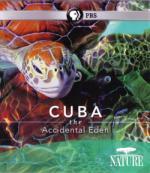 A PBS Nature program giving an overview of Cuba's magnificent ecology and biology - green sea turtles, Cuban crocodiles, scores of birds, gorgeous painted snails, wetlands, mangroves, rain forests, pristine beaches - and the threats, as well as potential threats, looming over their preserved biodiversity. The program is both a hopeful and frightening look at what might happen to Cuba's wildlife in the future. It is a solid PBS production; it does not have the magnificence of BBC's productions, but features both looking at wildlife and its habitat as well as talk with scientists and focus on their work, rather than BBC's almost exclusive focus on nature itself. Well worth a watch if you like these sorts of programs.